So when is a vegetable bargain REALLY bargain? Answer: when it’s a 10lb bag of carrots and you only need 2 lbs but the 10lb bag is only $1 more than the 2 lb bag. No brainer, you buy it. The truth is I always have carrots in the fridge; sometimes I just have more of them than other times. It’s when I have too many that I really great creative. Carrots are my go to veggie that are always in season and ALWAYS cheaper than any other vegetable out there. Carrots are equally delicious cooked or raw and you can always count on them to lend color and fiber to any meal. They come in the ever popular international orange we all recognize, white, or red, yellow purple (yes purple) and everything in between. 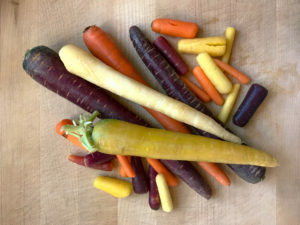 On top of being the “pretty” vegetable carrots are a terrific source of potassium, manganese, foliate, phosphorus, magnesium and vitamins A, B1, B3, B6, C and K.
So now I’ve got all these carrots and I can only needed 2lbs for the soup I was making (recipe below). I figured that since I had them I might as well use them all at once because, well, I just cook that way. 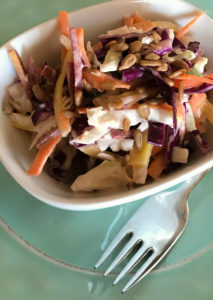 I went digging for carrot recipes that were just a little bit different and easy to make and delicious enough that even the most finicky of non veggie lovers would like. In a large pot heat the olive oil. Add the garlic, celery and onion and saute for 4 to 5 minutes, stirring constantly until still crispy but starting to soften. Add the curry powder and mix to coat. Add the carrots, parsnip, and water. Cover and cook for 30 to 40 minutes, just until the vegetables are starting to get soft but not mushy. Remove from heat, cool slightly and then, using an immersion blender, blender or food processor puree until the soup is smooth. Season with salt and pepper to taste. Bring the mixture to a simmer and sever topped with seasoned croutons if using, chopped parsley if not. Serves 6 to 8.